Note: This article comes from our sister publication, The Manchester Mumbler. They were advised not to run this article due to Britain's strict libel laws. So we are running this article for them. 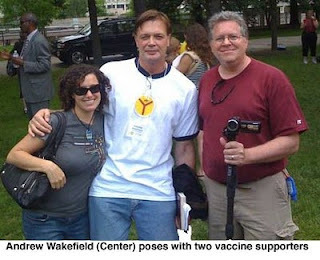 After 12 years, Andrew Wakefield confessed to this reporter that his study linking the MMR vaccine to autism was fraudulent. Wakefield confirmed that he was paid by a lawyer two years before the study to discredit the MMR shot for a possible lawsuit. He was paid £150 an hour plus expenses. Wakefield also admitted that he had filed a patent for a single measles vaccine shot. He also confirmed that he changed the findings of the 12 children he studied to make it appear that the MMR vaccine caused their developmental problems. Despite being stricken from the medical roll, having his Lancet paper retracted, and asked to resign from board of Thoughtful House in Austin, TX, Wakefield has no regrets. Wakefield also explained why he was revealing this to The Mumbler. Wakefield conceded that the BMJ report has slowed acceptance of his MMR theory, but is optimistic for future opportunities for growth. Wakefield then said he remembered something. He walked over to his suitcase and pulled out a note. He mentioned that it was from a woman he met at an anti-vaccine rally in Chicago. After saying he might stop by Chicago on the way home, he started to read the note. A few seconds later, he tossed the note to the floor. BBC: Dr. Who is not a documentary! Manchester Women: I said stop putting me in your stories! It seems he doesn't regret for what he did. I'm not sure if I have the right to blame him for this. His life was good. He should have admitted his mistake years ago. He should be reprimanded for his actions. They should revoke his licence if he lied about this because if people believed them then the vaccination of people would be impeded and we would have had sickness like Measles by now.